At the heart of modern physics is the surprisingly simple notion that the universe is fundamentally granular; all things are made of atoms. Although this notion has been remarkably robust to repeated experimental tests, and is a basic tenet of physics, our sensual experience of the world tells us the exact opposite. We experience a world that is smooth and continuous in the three dimensions of space and one of time that we move through as humans. In addition, this smooth universe seems to us to be effectively infinite - we could explore it for millions of lifetimes and still not find the edges. What we see with our unaided vision and senses is a world that is smooth and of unbounded extent. Within this observed reality, what design principles can we use to improve the limited discriminatory power of the human eye? A surprisingly useful approach is to segment the universe into one or more well defined regions of interest, which can then be subjected to deep scrutiny. The simplest case is to create a binary division of the universe into just two regions. The first region is a standalone frame; the spatial and temporal region of our particular interest, which by any measure is an infinitesimal piece of the universe. The second regions is everything that is outside of the frame, the exterior, which is the whole of the universe except our frame. In word algebra, the Universe = frame + exterior. Even with this minimal structure, the simple addition of the frame has helped us practically to increase discrimination within the frame. Our focus is now on the frame and its contents alone. What is in it? How many objects? What colour? What details? How does it change over the time period we are interested in? For the time being let us ignore the exterior, what is found outside the frame, we can pretend or assume that it has no bearing on our study, we can perhaps consider it later. The simple concept of an exactly reciprocal frame and exterior is suprisingly useful. In one form or another it has underpinned Western art since the 1400's and much of modern science either explicitly or implicty uses a frame as a way of focusing attention on a particular length scale or phenomena. The simplest frames that humans made were probably with their hands or natural objects that they found lying around. We still use a two-hand frame for the stereotypical framing of a scene, still used to give us an idea of how a photographic still or movie scene would look. The exterior is thrown away, we know that things of interest are happening there, but we have made a choice to exclude them from our frame and our concentrated study. The choice of what is in the frame and it's exact composition is one of the core creative tasks in art. Similarly, choosing what aspect of the universe will be the subject of intense scrutiny is a core task in science. Note that the segmentation of the universe into frame and exterior always introduces an issue, that can cause real problems if it isn't dealt with properly; the so-called edge effect. The extent of a frame is defined by the transition from frame to exterior and this edge throws up the need for each frame to have an associated set of rules for deciding what is in the frame and what is exterior to it. These rules can be arbitrary in general, but for quantitation they have to be logically robust. The advantages that accrue from using a frame to divide space or time can be multiplied by creating a structured multiplex of frames, or a grid, which can be used as a formal means of dividing space or time. The grid is a basic and versatile design principle, that we can use to get improved discrimination and quantification, with multiple examples in the applied arts and sciences. Note that grids can be composed of frames of different sizes and shapes and be overlapped, though in practice regular grids composed of and non-overlapping frames are of particular use. A ruler is an example of a grid -- it can be thought of as a linear array of frames. Over the past hundred years, one of the most widely used field techniques in ecology and geography has been quadrat sampling. A quadrat is a simple square frame, often with a unit side of 1 metre, that is used to isolate a sample from the larger world. Quadrats are used in ecology and geography for sampling plants, slow-moving animals and some aquatic organisms. It is a simple example of how a grid can be used to increase the discriminatory power of a study. 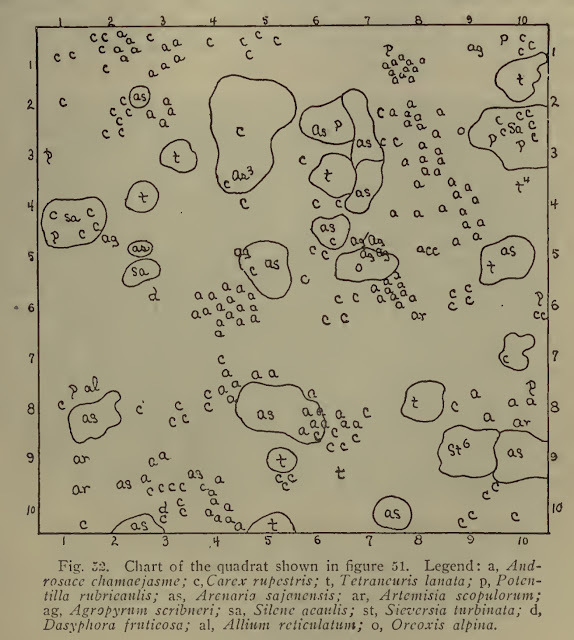 The earliest reference I can find to the use of a quadrat in ecology is from 1898 - by F.E. Clements and R. Pound. The quadrat is explained and illustrated in Research Methods in Ecology by F.E. Clements from 1905. A full copy can be downloaded at the internet archive HERE. An example of a 1 metre square quadrat mapped by Clements and shown on page 169 of his book is shown below.